Can you believe that today is the 100th Perfect Picture Book Week?? Is that exciting or what? 100 weeks of picture books! And not just any picture books, but ones that reviewers felt were perfect enough to share. Not only are there comprehensive reviews, but each review contains activities to go along with the book. And Susanna Leonard Hill, most magnificent host of Perfect Picture Book Friday, has compiled a categorized list of the books that have been reviewed. It’s an incredible resource for parents and teachers. For me as a writer, it has been a way to build my library list each week. My library list keeps me reading piles of picture books which is necessary for any writer who wants to improve their craft. To access the list, click HERE. 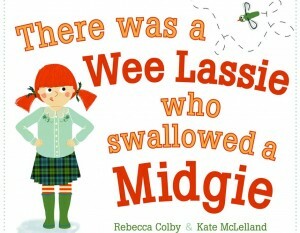 Synopsis: In this Scottish twist on a much-loved rhyme, the wee lassie swallows a succession of Scotland’s favorite creatures to catch that pesky midgie—including a puffin, a Scottie dog, a seal, and even Nessie! After all that, the wee lassie can’t still be hungry. Can she? There was a wee lassie who swallowed a midgie. I don’t know why she swallowed the midgie, so teeny and squidgy! it flip-flopped and swim-swam and bubbled about. The trailer is really cute and features bagpipes as the background music. Perfect! Resources: Rebecca created an amazing comprehensive teacher’s guide. You can find it HERE. Why I Love This Book: I love the rhythm, rhyming, and repetition in a good cumulative tale. There are a lot of cumulative tales out there. Like all other books, some are just ho-hum, but others find a permanent spot in my heart and on my bookshelf. Wee Lassie did just that. In her rewrite of a classic cumulative tale, Rebecca found ways to make it fresh, new, and fun. Choosing a Scottish theme was brilliant. She carries out the theme seamlessly and enhances her rhyme with creative language and words. Kids will giggle at all the creatures the hungry lass swallows. Kate McLelland’s illustrations are bright and appealing. I adore her depiction of the wee lassie. She caught that “hungry” personality perfectly! So if you’re like me, you’re probably not hungry enough to swallow a midgie, but you’re always hungry for a good picture book! Grab a copy of Rebecca’s fun tale! I promise it will satisfy!